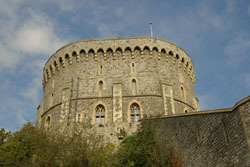 The Windsor Castle Screensaver allows you to enjoy the magnificence of this great castle while your computer is resting. The screensaver includes all the images that are part of the Virtual Tour along with many other colour photographs of the exterior and in the grounds of the Castle. Our Screensavers are all based on our free screensaver called Resta here. This allows you to purchase multiple screensavers from this site and they all function together as one screensaver, along with your own images. Resta is included on the Product CD.